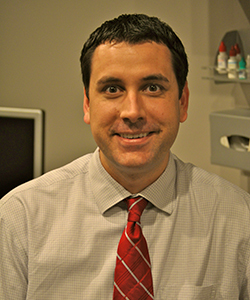 Dr. Nathan Csonka joined The Eye Care Center in 2004 upon graduation from the Pennsylvania College of Optometry, where he earned his Doctor of Optometry degree. He also earned a B.S. in Vertebrate Physiology from Pennsylvania State University and a B.S. in Visual Sciences from the Pennsylvania College of Optometry. Dr. Csonka is board certified by the American Board of Optometry in the Treatment and Management of Ocular Disease. He completed clinical externships at Hahnemann Hospital in Philadelphia, Suburban Mercy Hospital in Norristown, as well as with one of the leading optometrists in treating glaucoma: Dr. G. Richard Bennett. He is a member of the American and Pennsylvania Optometric Societies. He also holds a certification in the fitting or Paragon CRT contact lenses, a type of contact lens that corrects your vision while you sleep. His focus in optometry lies in the treatment of dry eye, the treatment and management of glaucoma and the fitting of specialty contact lenses. His interests include golf, football, music and travel. © 2015 The Eye Care center. Theme Developed by SocialEyesLLC .